Go to the Home tab, click New Slide, select the Import tab, and click the Storyline option. 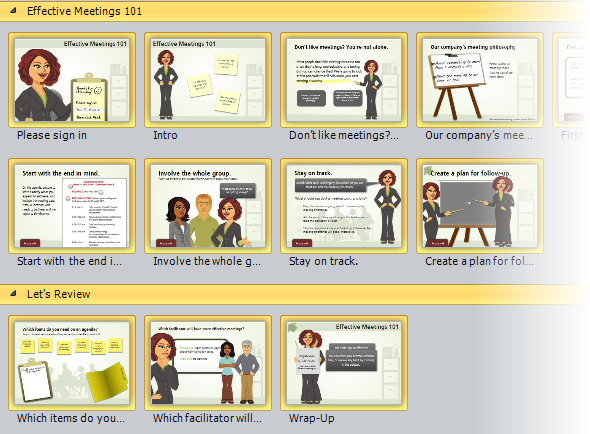 Go to the Insert tab, click New Slide, select the Import tab, and click the Storyline option. 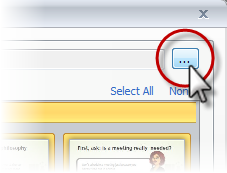 In Story View, right-click anywhere in the workspace, select New Slide, select the Import tab, and click the Storyline option. In Normal View, right-click anywhere in the left navigation pane, select New Slide, select the Import tab, and click the Storyline option. 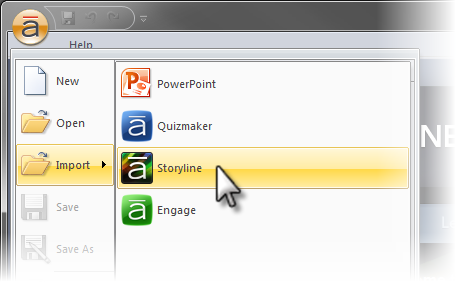 Then browse to and select the Storyline file that contains the slides you want to import, and click the Open button. If you opened the wrong Storyline file or want to select a different Storyline file, click the ellipsis (…) button in the upper right corner to browse for another file. By default, all slides will be selected and imported unless you specify otherwise. 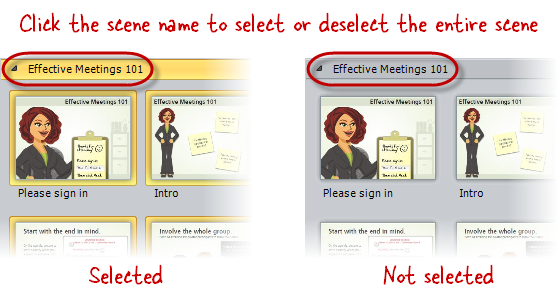 You can tell which slides are "selected" by their yellow outline. 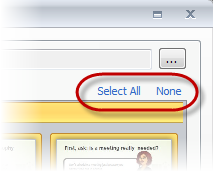 To select or deselect a specific slide, simply click it, and the yellow outline will either appear or disappear to indicate its status. You can also use the Select All and None hyperlinks in the upper right corner to quickly select all the slides or to deselect all the slides at once. To select or deselect an entire scene and all the slides that it contains, simply click the scene name. The scene name and all the slides in that scene will either be highlighted in yellow to indicate that they have been selected to be imported, or the yellow highlighting will disappear to indicate that they will not be imported. The default option, Same as imported project, will create a new scene for each corresponding scene that you import and will name each scene with the same name that it had in the original story. If you select New Scene, use the Scene field to assign a name to the new scene. You can also import all the selected scenes and slides into the currently selected scene in your story by choosing Current Scene. Click the Import button to complete the process.